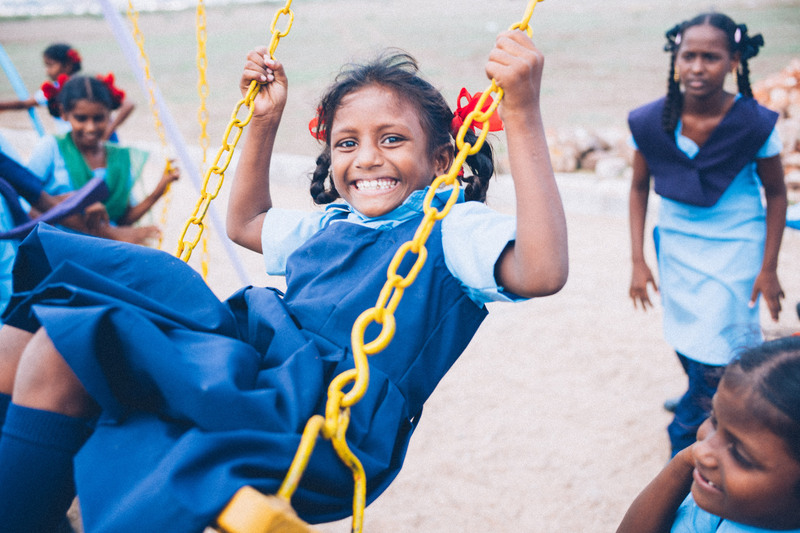 Photo: One of our newly rescued orphans is thankful for the new playground equipment on our campus which provides a fun break from her schoolwork. In June we had 40 children re-registered in our on-campus primary school for the new semester. 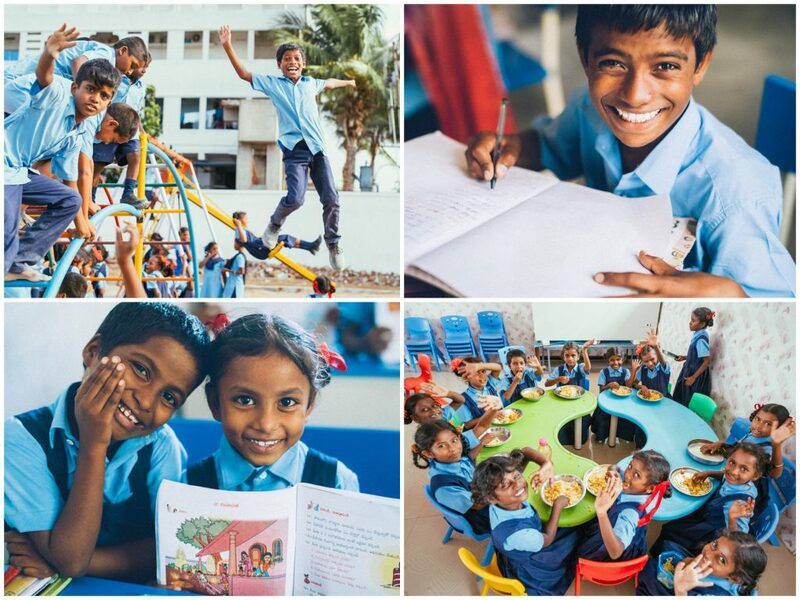 After going through the registration process per new government requirements, our native team accepted 49 new rescues and other applicants (ages 5-13) who are also now enrolled at our primary school where they are studying their native Telugu and Hindi languages, English, math, science, and social studies. In addition, we have 35 older children (ages 13-16) currently re-registered to attend higher classes off-campus. The older children are studying their native Telugu and Hindi languages, English, math, physical science, natural science, and social studies until the school semester ends in December. We are happy to report that during the first week of July we installed new playground equipment on campus, including slides, Jacob’s Ladders, seesaws, swing sets, and jungle gyms. This improvement to our campus is a great blessing to the children since our old playground equipment faithfully served hundreds of orphans over its lifetime (about 10 years), and all of the old items finally gave out with rust due to the salty coastal humid air. The children are very happy about all of the new, safe playground equipment because they love to play on it when they are on break from their studies. To further improve the environment of our campus and thanks to your support, we completed construction to the campus wall on July 13th — we raised the height of the wall by 3 feet as demanded by the Department of Children’s Homes upon a recent inspection. We also recently installed cement window frames and iron entry gates for the Girls Home as extra measures toward securing their protection and comfort. In other good news, 6 girls from our orphan home who graduated from high school are now enrolled in college thanks to the generosity of donors who pledged their full scholarships for the next 4 years. When they graduate from college, 1 girl wants to be an accountant, 1 girl wants to work with the police, 2 girls want to be nurses, and 2 girls want to be teachers. Hello, my name is Chandni, I came from a family of 9 brothers and sisters, a big family, and I lost my father while I was the age of 4. After that my mother didn’t know what to do to feed us, we come from a tribal caste that has no history of education in our local culture. In those days my mother was doing hard work just to make enough money to buy us the most basic food, it became so hard for her to give food three times in a day, it’s a very big family . . . so hard to feed, my mother’s jobs were sweeping and cleaning in the houses and so sometimes we would spend days going without food. In those days my brothers and mother wanted to sell me to be a servant of some rich people. But around that time my mother heard about the ‘She Has Hope’ Girls Home. Soon after she heard about it, she got some courage and brought me here when I was the age of five. I came here and started studying at the school in first grade. Since then until now I have experienced so much love and kindness here. All the staff members have taken such good care of me, we have always had very good food, a great dining hall full of love to feed us sufficiently, and safe water, a nice dormitory with good bedding, and solar power. This campus is like a mother to me, it became my house and my life, so many memories are here. Now I am leaving the girls home with tears, I am so sad to leave, but going from here with great expectations, with full of tears of joy. It is so hard to leave the home, me and my sisters also graduating cannot find such a lovely father and mother anywhere, their love feels greater even than my actual mother’s love, they have always encouraged me to press on, to continue on with my education. They always told us that there is bright future for every child here. Now I am going home, I am the only one girl from my family or caste who ever graduated from high school. This is basically a race situation in our community (called caste) so, my brothers and mother are encouraging me to go to college, but they are not able to meet my education expenses. I am waiting and praying for my studies. I want to become a teacher to help other children like I was. We learned here how to depend on God. I am sending special thanks to my sponsors from bottom places of my heart, really they have done a great work, they became a blessing to me, thanks to my sponsors for sponsoring all these years. and thanks to everyone who helped. Thank you all.